It’s fair to say, I’m a football person. I love the game, I love it’s varied and diverse cultures, I love its fans. Therefore, the issues of ‘active support’ and ‘fan culture’ are fairly close to my heart. When active support is done well, it’s one of the best things about live sport. Some of my favourite live sporting experiences have been at Westpac singing and chanting and cheering on the Nix. Equally, it’s fair to say New Zealand rugby doesn’t have such a strong relationship with active support – as has been well documented elsewhere. So, you can imagine my surprise and delight when, about five minutes after kickoff, a group of about twelve Northland fans took up a seat about three rows in front of me – all of whom seemed fairly determined to make sure we all knew who they were backing. Without wanting to presuppose too much, they all had the classic scarfie look about them, almost certainly having come from the North to university, but still staying loyal to their beloved Taniwha. They came with their songs as well – from the Atomic Kitten classic “Debreczeni you’re the one” to “There’s only one Rene Ranger” to “Sam Nock’s on fire” as well as the classic, if slightly overdone, “Everywhere we go, people want to know…” It was brilliant. Make no mistake, I am as Otago as they come. I cried when we won the Shield (and when Hawkes Bay stole it a week later) and Colin Hawke is still a swear word in our house. But I digress, despite backing the wrong team, they were fantastic and were significantly adding to my enjoyment – and for a good chunk of those around me. It was almost too good to be true – and indeed it was. As if on cue, a Red Badge security guard appeared. 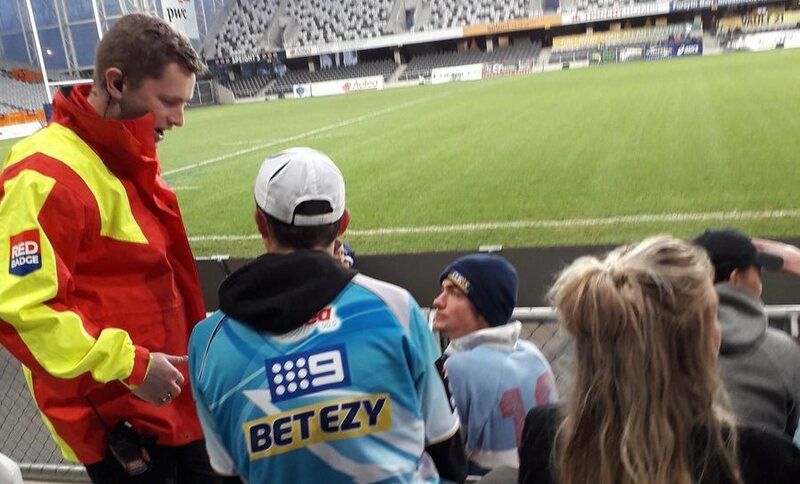 I can not stress enough, that not one of the Taniwha fans was abusive, offensive or aggressive to any fellow spectator, any security, any official or player or even the referee. They may have stood up a few times, but there was virtually no one behind them to worry about. After a few warnings of “If don’t settle down, you can go” and trying to move them to their ticketed seats (with about twenty thousand empty, I’m not sure this was an issue), they were eventually told to go. In between warnings, both myself and my cousin, among others, encouraged the security guard to show some common sense and realise how many people they were harming (which was no-one). The response of “They’re clearly intoxicated, they’re lucky to still be here” that came was pretty disappointing. I can safely say, there was nothing they were doing that I wouldn’t/haven’t done sober. 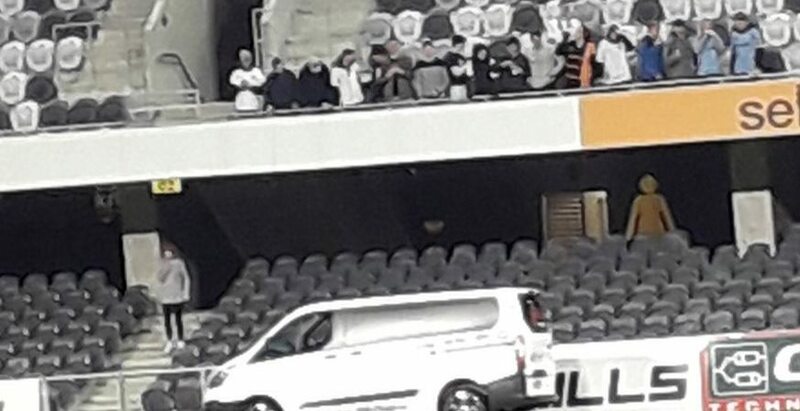 Fortunately, they weren’t evicted, but moved to a section of the stadium away from the suit and ties, and about 15 metres away from anyone else, albeit with three security guards to themselves. As they left, they treated us to a rendition of “Stay quiet, if you love Northland” which saw more than a few sheep-ish grins among the home fanbase. While the second half saw Otago slowly get on top and win the game, there’s no doubt I had more fun in the first with my new friends. Unsurprisingly, they were still clearly audible from the other side of the ground. For the record, I don’t blame that security guard. I do blame the policies and do despair for the culture that leads to things like this happening. I don’t know how to fix it, but I do know it needs fixing. And just maybe the thing that revives the NPC is active support. I, for one, hope it is.